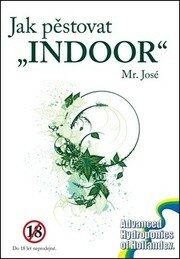 How to grow "INDOOR" is the most comprehensive book on growing under artificial lighting in the Czech language. Learn from experienced grower, and make your way to a successful harvest. 341 pages, perfect binding. Stews build step by step. Overview growing from seed selection to harvesting. Detailed information on lighting, irrigation, ventilation and silvicultural systems. Troubleshooting tips. Description of the advanced techniques of plant cultivation. More than 150 photos and drawings.